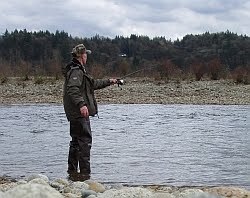 Bill Otway, one of BC's leading conservationist and fishery advisers, who also happens to be a good and much valued friend of mine, advised me a few days ago that the annual fishing license sales for 2009 and into 2010 have increased by over seven percent. This means, according to Bill, that there are over 21,000 new anglers in 2009. This in turn means that an additional $ 211,000 will flow in the coffers of the Habitat Conservation Trust Foundation, where the money will be used to in enhancement programs pf fish stocks and the fishery. Gaining over seven percent new anglers also means that the provincial government receives an additional $700,000 into their coffers. From a different source I learned that hunter numbers in BC, and with that hunting license sales – more money for the BE government -, have gone up considerably too. With this upswing it is surprising for me to hear that our provincial government has announced further cuts, again, in the range of one million dollars for the Fish and Wildlife Service Branch. Our Conservation Officers are stretched to the limit financially and if these cuts keep up I cannot see how the CO’s will be able to fulfill the ever-growing mandate of wildlife conservation, policing and environment protection. Apart from that I am thrilled to see more anglers and hunters in the field. This means that the tireless promotion of our many angling and hunting lobbying groups, organizations, and the many dedicated individuals is starting to pay off. We’re still a ways off from where we eventually want to be but it’s a good start and an encouragement to keep the work up. That's great news! Maybe we are turning the tide. The Rasch Outdoor Chronicles: Yo-Yos for Troops! 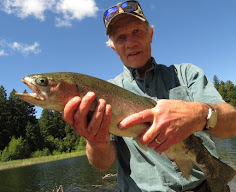 Nice blog, and interesting information on the fishing statistics. As a fishermen, mostly what folks here call roughfish, I apreciate the importance of a well funded fishing authority. Let's protect our future by being good conservationists!